Beyoncé needs no introduction. She's a great artist with many talents : She sings, she dances, she writes, she acts, she models, she designs, she produces, and who knows what else she'll add to her portfolio in the future! She's been dominating the entertainment business for close to two decades, always innovating and bringing new energy to the industry. At 33 years old, so far she won 10 awards in the retail industry, 5 awards in the films/television industry, 4 awards in the business/wealth industry, 5 awards in the personality/image industry, 1 award in journalism, 1 award in philanthropy, and a staggering 312 in the music industry including the first African American woman to win the the Songwriter of the year from the American Society of Composers, Authors and Publishers. Looks like she's on her way to becoming the artist with with most awards as well. 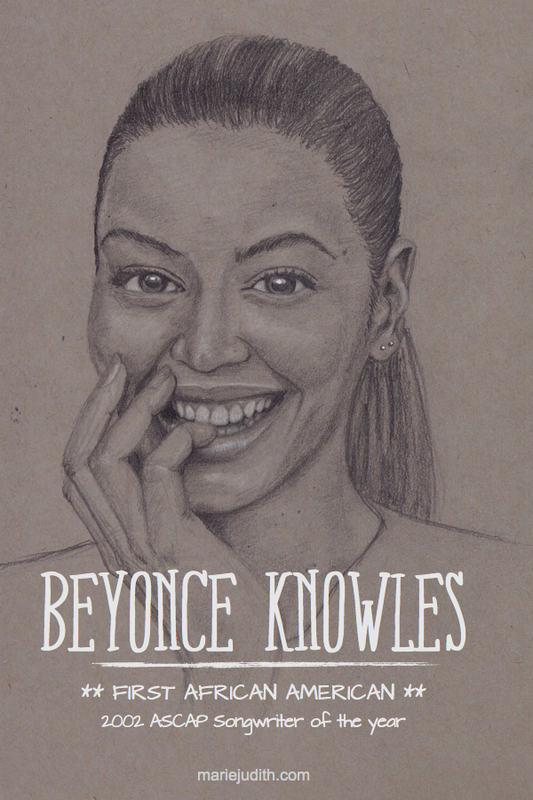 Beyoncé is a huge inspiration for me as an artist and as a woman. She constantly pushes herself to learn and do more, perfect her craft and see where it takes her. She's a very hardworking woman from what I can see and as a results is able to reap the benefits for such focus and dedication. She's a great example of what happens when you give your all to pursue your passion.